Kindle USB charging... If you don't have your wall charger handy, you can charge your kindle by plugging into a computer through a micro USB. Note that not all computer USB ports will allow charge, so if it's not charging try another. 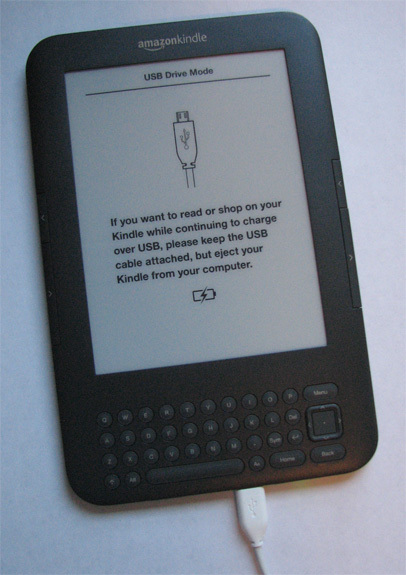 While plugged in this way, the Kindle becomes a drive on your computer. If you want to continue reading, you need to 'eject' is at a drive. PC: Go to My Computer, select the Kindle drive, right click, eject. Now you can use your kindle as a kindle. Note that you should always 'eject' it as a kindle drive before breaking the connection between kindle and computer. With heavy storms coming to the East coast this week, don't forget to plug in your kindle now and get it fully charged so there's no reason to be without your books if you have a power outage! Stay safe!